What exactly do you need to collect after an accident? Here are some tips for getting the documentation you need to get the best outcome possible. After a crash, you need to make sure you get personal information from the parties involved. This includes their names, addresses, phone numbers, insurance companies, driver’s license information, and license plate number. You should also get a description of the vehicle as well as the surrounding conditions. Take detailed notes of everything, from the location to the time and date and weather conditions. Memories tend to get hazy over time, so jot everything down while you still remember it. Many car accident cases are a he said/she said situation. Each side is trying to blame the other. It may be difficult for the insurance companies to determine who exactly is at fault. That is why pictures can be helpful. As the saying goes, a picture is worth a thousand words. Photos can preserve evidence, which will be useful in finding fault. Have a camera in your vehicle or your smartphone handy immediately following an accident. Unless you are in an unsafe area of the road, consider not moving your vehicle until you have photos of the vehicles and surrounding areas. There may even be cameras at an intersection or nearby business that can be helpful in your case. Be sure to take photos of vehicle damage, road conditions, weather conditions, and any injuries you sustained. 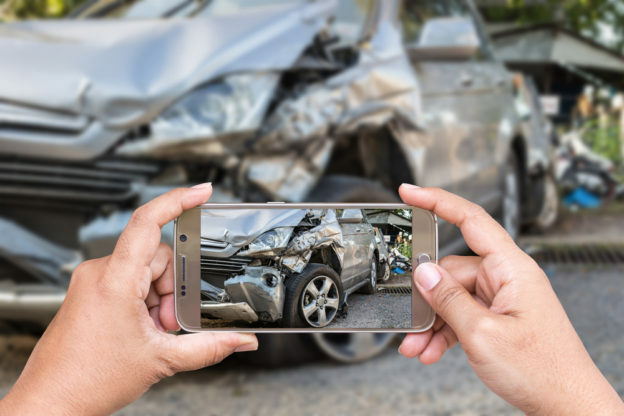 You should also get some pictures of nearby road signs, poles, traffic signals, and other identifying objects, especially if they were damaged in the crash. Unless the crash happened in a rural area with nobody around, it is likely that someone witnessed the accident. If you can find someone to vouch for the fact that you were not at fault, that is even better. However, having someone say you did not do it is not even enough for some cases. Not only do you need a witness, but you need a credible one. Who is considered a credible witness? First, the witness must have seen the accident from start to finish. Hearing a loud noise and seeing two cars in a mangled mess is not enough. The witness also should not rely on rumors or be distracted during the crash. Credibility also refers to a person’s physical or mental condition. For example, was the witness intoxicated at the time? Is he or she a felon? Does he or she have a reputation for being dishonest? Does the witness have poor hearing or eyesight? Is the witness easily confused or suffer from poor memory? If so, then the witness’s credibility may be questioned. In order to prepare a case against the negligent party, you and your lawyer need to be prepared. Your lawyer will use this information to build a case and negotiate with the insurance company or third party responsible for your accident. For example, medical records will be able to prove how injured you were. A witness statement can prove that you were not at fault. The more documentation you can present to your lawyer, the better. A car accident can lead to serious injuries and even fatalities. There are many types of personal injury compensation that may be available to you. Information, photos and witnesses will strengthen your case. The Law Office of Jeffrey K. Kestenbaum can help you with your car accident claim. Contact our Brooklyn office at (718) 237-5586 to schedule a consultation.